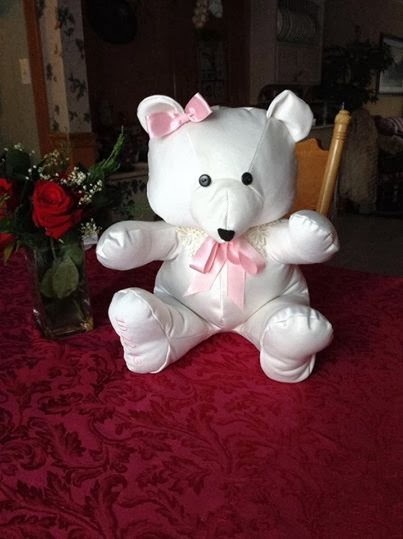 A grand mom contacted us to create a teddy bear from her wedding gown for her soon to be christened granddaughter and another one for her soon to be born grandson. We used the lace applique as a collar and pink ribbon as an accent. The baby’s birth date was machine embroidered on teddy’s foot as will her grandson’s when he is born. What a wonderful way to pass on memories from grandma! We are going to also offer, when there is suitable material, for teddy to be dressed in a vest or skirt. Thanks Cathy for this wonderful idea. I have 1 granddaughter myself and 1 on the way in March too and will be using my own gown for them. I’ll post pics when done! 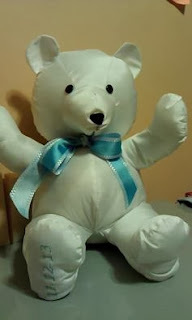 For information and pricing, check out our website, www.christeningcreations.com! How cute is this?